The Carlisle SMT (Surface Mixed Tube) Ribbon Burners are designed for maximum safety, durability, and performance. The SMT is a totally surfaced mixed burner, and thus has virtually no possibility of flashback. These burners may be used with a mixture of oxygen and either natural gas, propane, or even hydrogen. The SMT maintains a very hot sharp fire with a continuously even flame in any position, therefore eliminating any cold spots. These burners can operate at extremely high velocities and yet can be pulled back to an almost invisible flame. The SMT is manufactured from stainless steel with the porting itself consisting of monel hypotubes. The SMT can be made in flame lengths as small as a 1/2" to as large as 13". It is important to note that flame space does not reflect the burner's overall length. 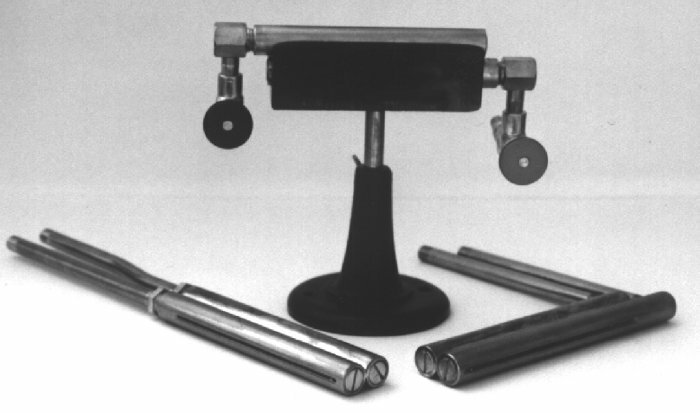 It should be noted that with a larger flame length, a set of retaining clamps may be needed to maintain a uniform flame. Carlisle will install this option as requested, and recommend if the option is required. SMT's are available in four different styles for ease of use. These styles are depicted on the lower right hand corner of this bulletin. Both style "A" and "C" are for machine mounting. They are available with the optional cast iron clamp to facilitate their mounting to any machine. Style "B" Complete is used for bench work and comes with a set of red and green handled valves. The Style "B" is also fitted into a cast iron case and bench stand. The Style "BC" is identical to the Style "B" with the exception that the two valves are located on the same side of the burner, resembling the feed tube setup of the Style "C" SMT.